20-25 June, or 26 June - 2 July, 2016. PADI is the world leader in dive training with over 40 years experience. The Gulf Coast Council has approved Discovery Dive World, an exclusive PADI 5-Star training facility, as a BSA Scuba Merit Badge center. Discovery Dive World’s professional PADI staff will conduct scuba training courses at the 2016 Spanish Trail Scout camps, as well as offer training to local troops in the Niceville, Ft Walton Beach and surrounding areas. Achieving the Scuba Diving merit badge results in a PADI Open Water Diver Certification… a lifetime certification that is only the first step into an endless world of new experiences, adventure and fun. 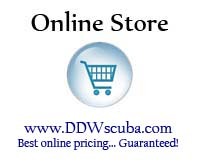 Demonstrate knowledge of first aid for injuries or illnesses that could occur while scuba diving. 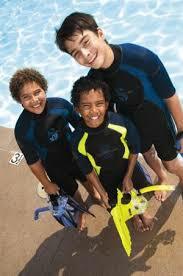 Earn the Swimming merit badge (prerequisite for scuba diving training). 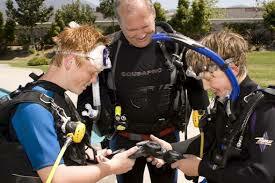 Discuss and explain the importance of the Scuba Diver’s Code with your merit badge counselor. 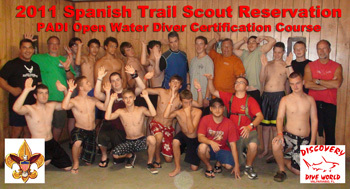 Earn an Open Water Diver Certification from a scuba organization recognized by the BSA. Learn about three career opportunities in the scuba industry. Contact Discovery Dive World at (850) 678-5001 to request a group presentation to provide information and answer questions. Discovery Dive World will then organize a schedule for the course program.